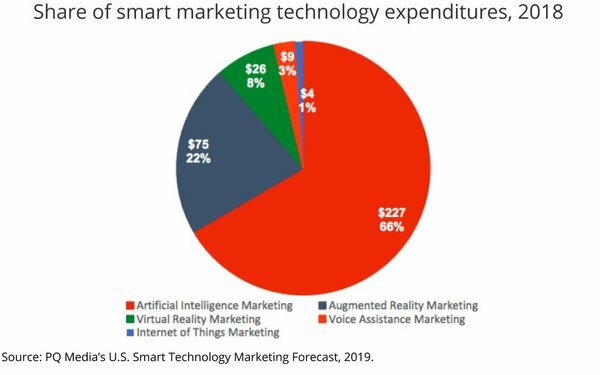 Smart technology marketing -- AI, AR, VR, IoT and voice assistants -- was by far the fastest-growing segment of investment by marketers in 2018, albeit on a relatively small base. That is the top-line finding of the first-ever benchmark on the burgeoning category from media industry economists PQ Media. 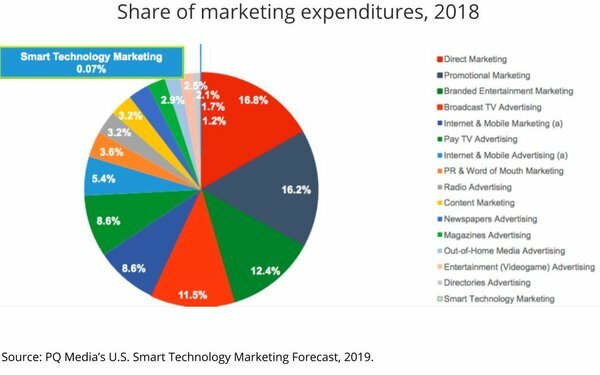 While smart technology currently represents just 0.7% of marketing expenditures, it expanded 393% to $340 million in 2018 and is projected to rise to $7.086 billion in 2023, according to PQ’s just-released U.S. Smart Technology Forecast. “Some pundits are calling smart technology marketing the ‘Holy Grail,’ because of its ability to engage customers at the point of decision,” the report notes, adding that it nonetheless faces some big impediments, including the fact that no standardized metrics yet exist to measure the return on marketing investments. 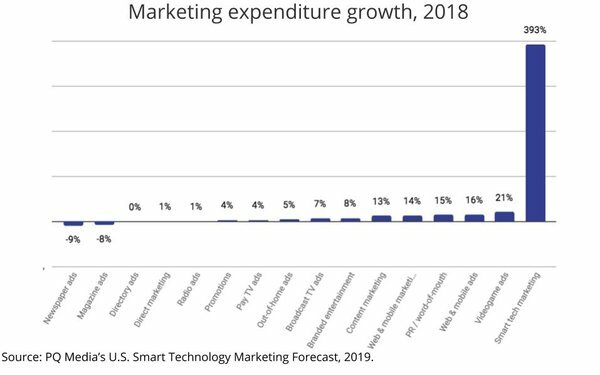 Artificial intelligence was the fastest-growing and largest segment of smart technology marketing in 2018, representing two-thirds of the category’s overall investment by marketers. AR and VR were the next-biggest segments, followed by voice assistant marketing. For all the industry discussions over the past few years, IoT appears to be a non-starter, capturing just 1% of the category -- so far.